Julia and I spent a quick and very quiet week in Maine recently, staying at the Barn, about a mile or so from the Landing, our usual spot. No Eggomoggin Reach view, but quietly placed in the woods, at the edge of a meadow. At the top of the hill behind the Barn, there’s a view of the Camden Hills over a blueberry field. Very tranquil with no TV or wireless. Adequate 3G signal allowed contact with the outside world. 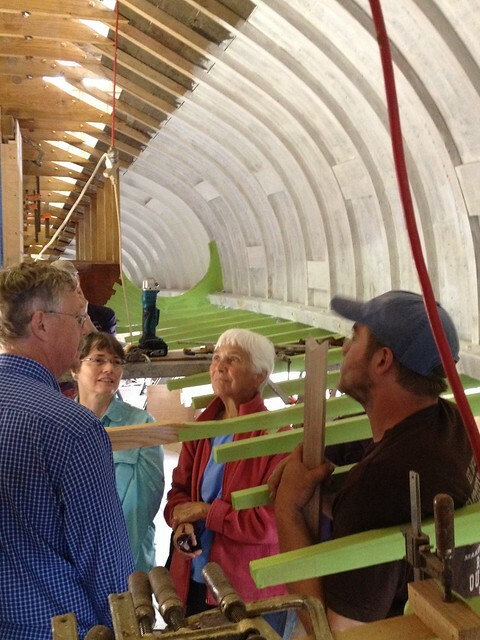 Our visit was timed to match the 40th Anniversary Celebration last weekend at WoodenBoat Magazine in Brooklin, Maine. After a boat yard tour and firemen’s barbeque on Friday, we went to a Lobster Dinner at the grounds of WB. The office, boatbuilding school and extensive meadows overlook Eggomoggin Reach and the Babsons. It was great to celebrate a long journey with Jon Wilson, Mike Murphy, Scott Bell and the rest of the WB staff and readers. 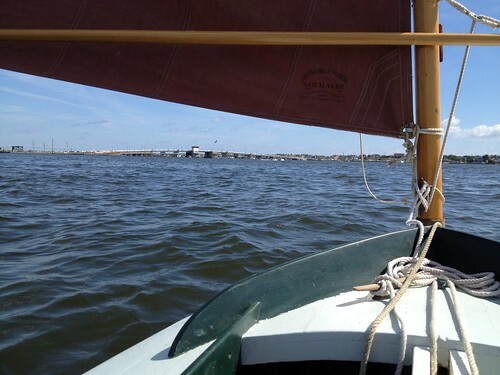 We went for a short sail on Monday in the harbor at WoodenBoat with Anne and Colin aboard Mimi Rose. 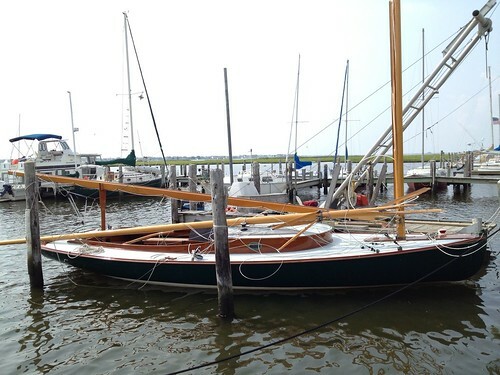 She’s a 32′ Joel White sloop that’s near the top of my list for a perfect cruising boat. 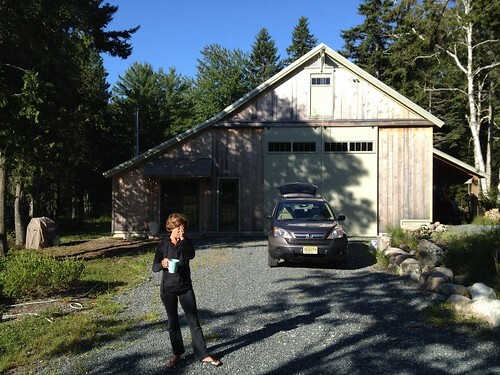 You can follow along with Anne, Colin and dog Maye at their blog, From Pine to Palm. The Duckboat Worlds were a week ago, but the Easterlies were a bit much for this slow sailor. Last year I had a problem with what turned out to be a backwards mast step. The heel of the mast needs trimming as well. 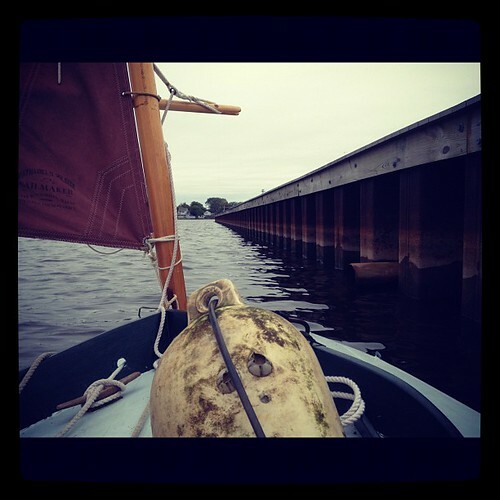 Now that Sjogin’s almost done, thoughts turn to more Duckboat sailing. 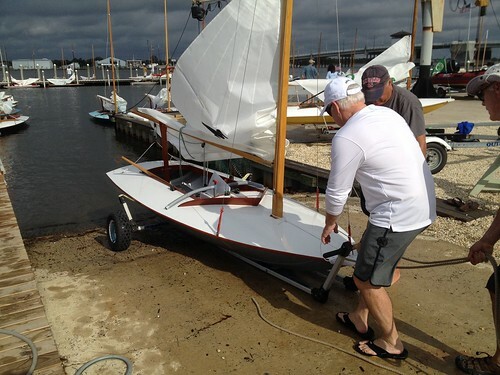 A shallow draft rudder is next on the list for Speedwell. Lots of recent progress on Sjogin. The first two of three primer coats is on and the planking looks better than expected. At this point she could pass a twenty foot test. 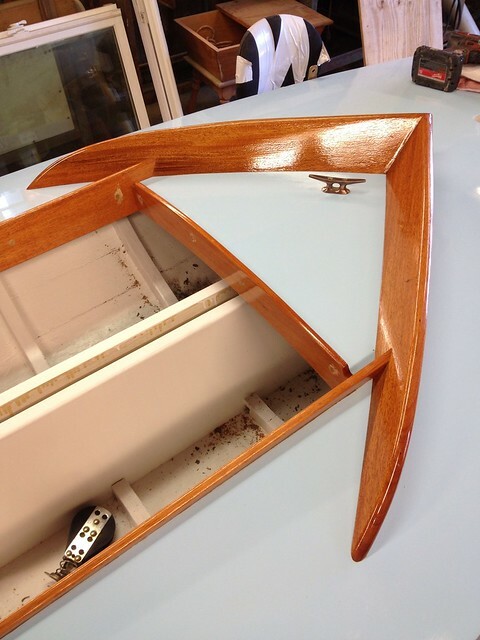 There’s also varnish on the rails and the new teak hatch sealed and looking good. Paul’s been busy installing a new deck prism, set between the mast and the mooring bit as well as reinstalling the vent plate forward. 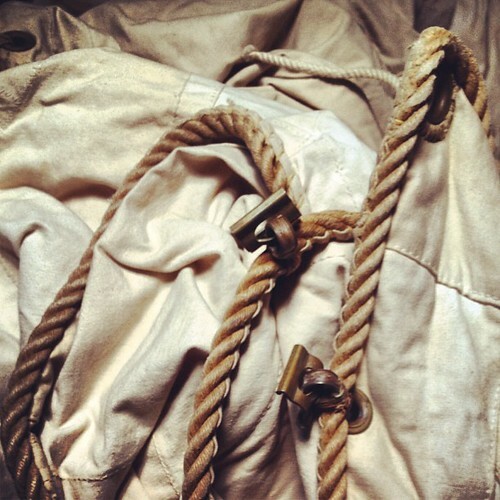 And there’s a new collar for the mast coat. Thens there’s Jeff’s work on the bottom. All the rivet heads have been cleaned and re-puttied and the bottom’s been painted. Very smooth. Progress on many fronts. Julia swatting gnats at our idyllic spot in the Maine woods. Very quiet. 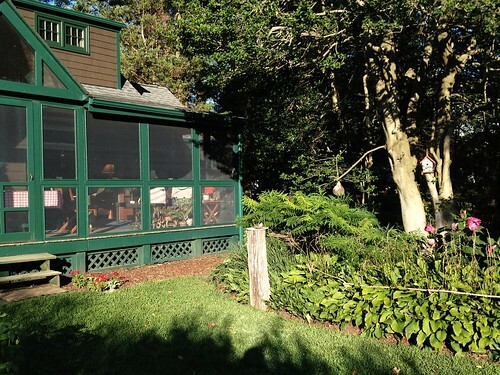 The outdoor shower in the back is enclosed only by the Maine woods. Private and delightful on a brisk morning. 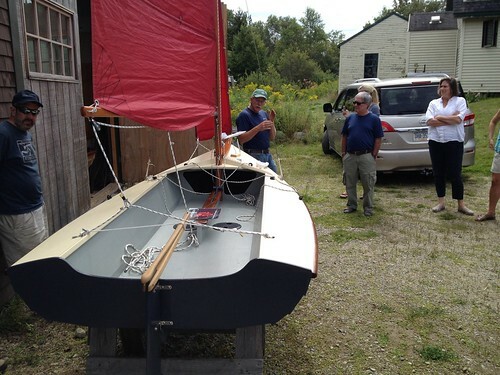 Dave Tew, WBF friend, at Brooklin Boat Yard along side a Frers 74. 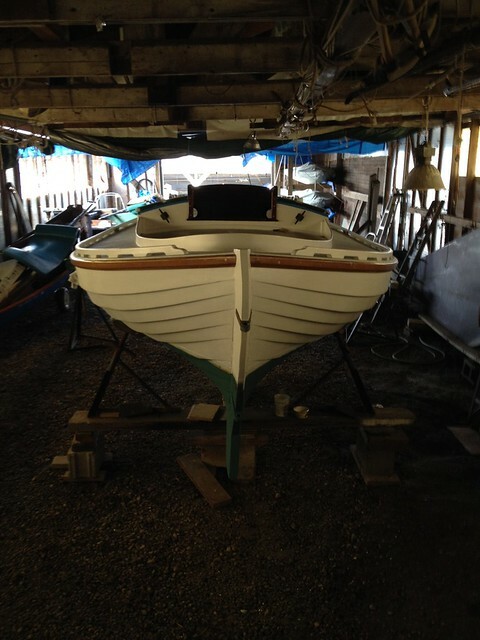 BBY was the first stop on the boatyard tour. The deadlights in the hull and deck are designed by Frank Gehry. Amazing effort by the crew at BBY. Extremely meticulous work. John Brooks discussing his brilliant new Dragon Flyer design. She would be great on Stockton Lake. 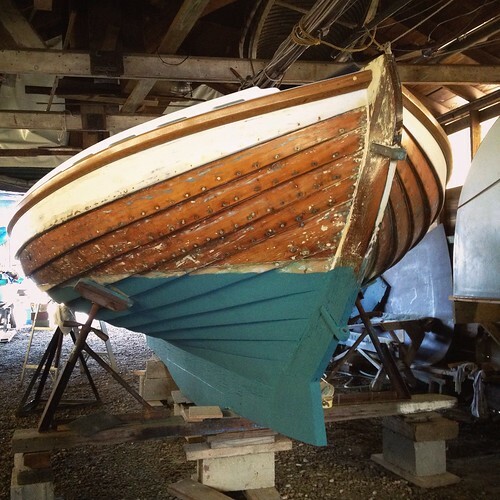 Here’s a Fisher’s Island 31 undergoing restoration at Brion Reiff’s yard. 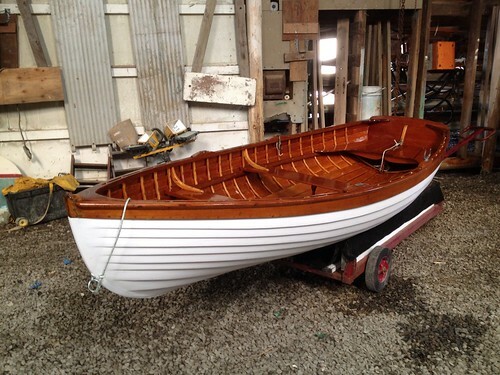 A new R Boat under construction at Reiff’s yard. 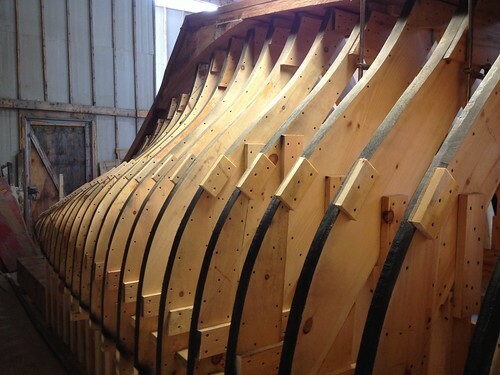 The amount of boat building talent in the Brooklin area is incredible. 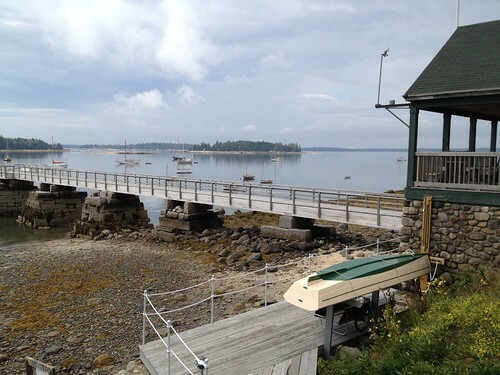 Here’s the harbor at WoodenBoat, just off Eggomoggin Reach. Low tide with the Babson Islands in view. Ahhhhh….. 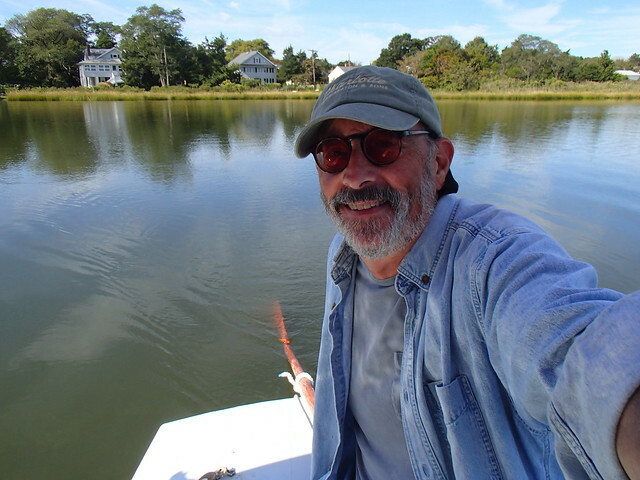 Thank you WoodenBoat for the boatyard tours, the hospitality, a great lobster dinnah’ and forty years of keeping the dream alive…. On the way to MYC the day before the Worlds. The mast step issue seems resolved but still not sure how it would work in moderate winds. More testing needed. One of the new Beaton Duckboats being launched for the first time. Where’s the Champagne? 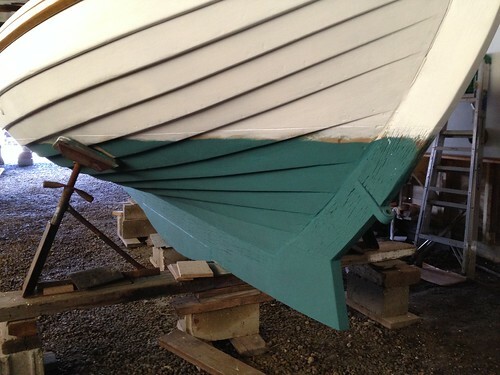 The hull after two coats of Interlux sealer. 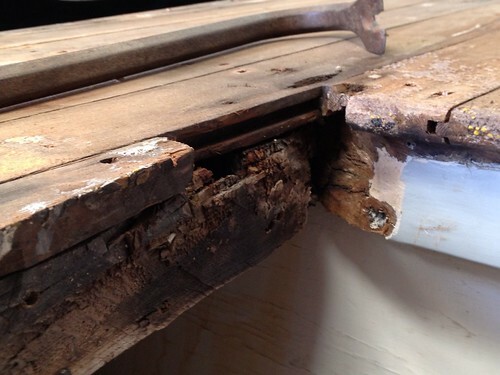 This will help keep the moisture from the bare inside face of the plank from lifting the paint. We’ll see. Second coat of primer. After a bit of filing the worst spots a third coat will go on. Then the sanding, fairing and getting ready for the two finish coats begins. 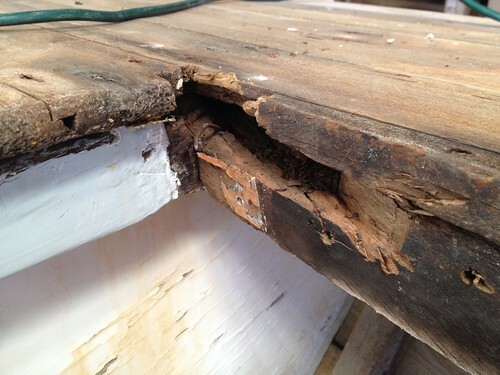 Here’s a close-up showing the rediscovered waterline. A bit of creative tool use restored the groove that divides the colors. With a slight groove at the waterline it’s easy to get a crisp edge without relying on tape. More soon. I promise Peter. Also getting ready for the Duckboat Worlds next Friday. The deck will get a quick scrapping and paint job but that’s about it. After the coaming came out it was clear that some slab carpentry needs to be done all the way aft and on either side of the forward ends. This was all expected as I’ve been patching those spots for years. All in all nothing too major. The deck’s been fully scraped and the picking out the loose rust from the iron nails has started. 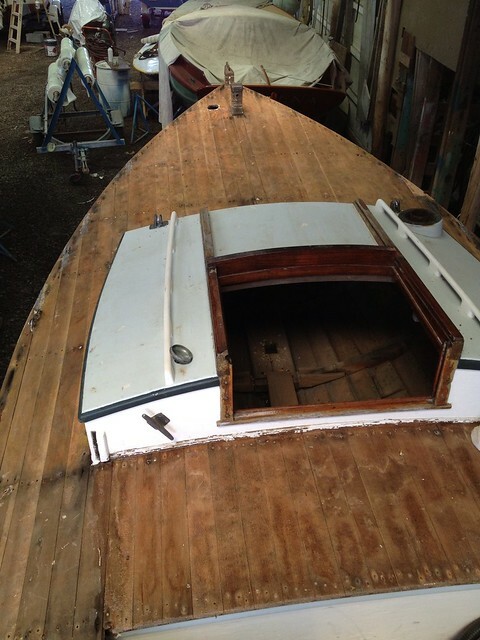 When clean the deck will be roughly planed and faired. The holes will be then filled with epoxy filler to get ready for the next step. 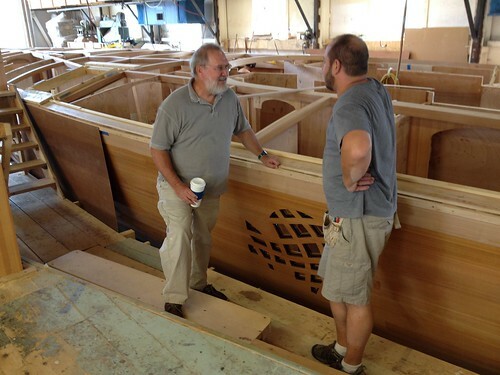 I spoke with Newport Nautical Timbers this week and it seems they may have floor timber stock. Julia and I are heading to Maine in late September and will stop by in Bristol at their timber yard to make a selection. To make up for the lack of Sjogin pics, there’s some items from Beaton’s and our gardens. Port side end of the cockpit carlin where it meets the main deck beam. The carlin will be cut back at an angle and a new piece scarfed in place. 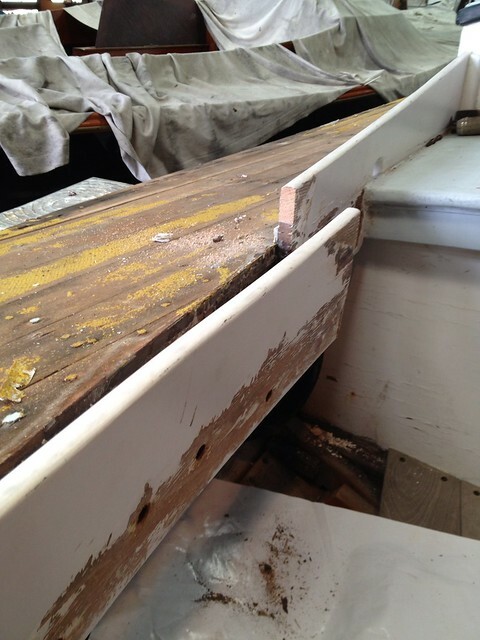 The deck beam will need to have a piece glued in and a new notch cut to receive the end of the carlin. Some of the deck will need to come off as well. Here’s the starboard side. Same problem. Not too bad here. About a half inch will need to be cut out and a filler piece fit and glued in place. Then I’ll need to recreate the curved bits at the corners. The deck has been fully scraped and ready for the next stage. Ghost Busted! Sad end to a fine spar. I think they can use one of their older ones to get through the rest of the season. Duckboat Frenzy! The Worlds are at Mantoloking next Friday the 23rd. 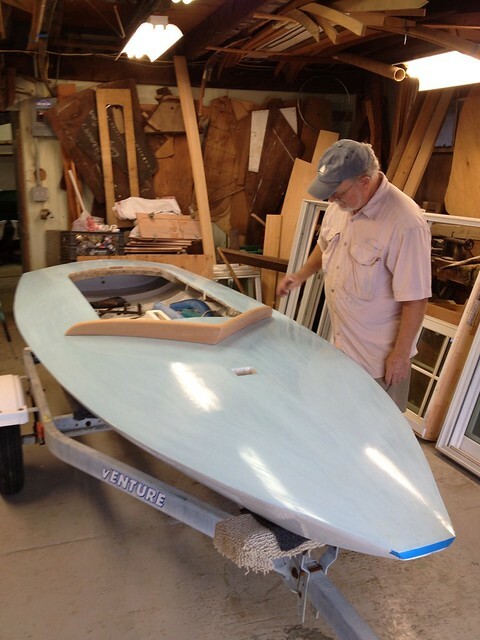 Here’s Paul Smith fitting a new splash board. The rest of the yard is busy on Duckboats as well. Some of them needed Sandy repairs. Fitted the same way it was done a half century ago. Bright morning sun with the Hibiscus in all their glory. A quiet day on Stockton Lake. More Speedwell adventures after the Worlds. 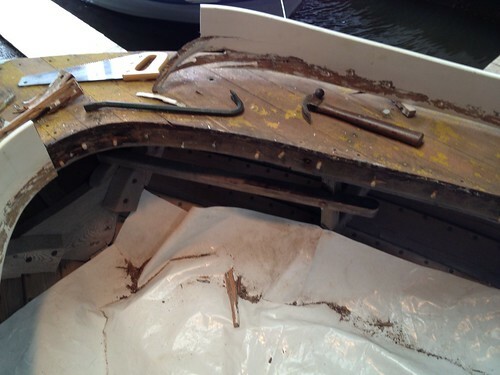 A coamingectomy pretty well describes the progress over the last few weeks as the coaming has been removed. This will make the new deck covering job easier (for Paul). Still haven’t heard back from Newport Nautical Timbers. I hope they’re out sailing. If anyone can suggest a source for swept white oak timbers, please let me know. Thanks. 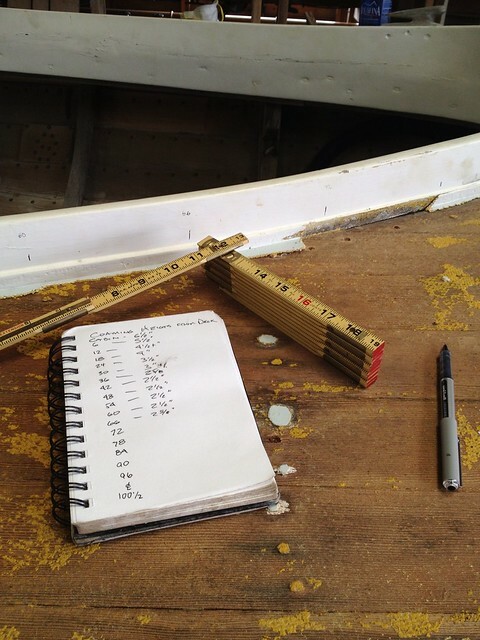 Before removing the coaming I recorded the heights every six inches. A pattern will be made so that sweet shape is retained. Starting to pull the coaming. It had to come out in pieces due to the barbed nail fastenings. You can see the holes made with the shop made drill to cut around the nail heads. The saw cut was at the original joint. 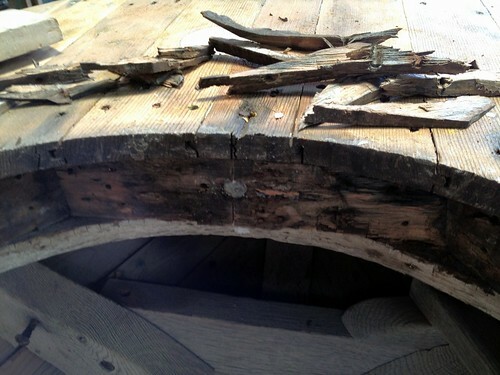 When I became her caretaker the joint had warped, thus evidence of the dutchman used to bring the pieces back in line. Let’s hear it for epoxy. After a cut was made on the centerline, another had to be made about a foot away. after a bit of chisel and crow bar work the coaming pieces came free. There’s a bit of punkiness right aft that will need excavation and repair. When I pulled the forward ends of the coamings off there are some spots in the carlin and main beam joint that will need to be addressed. All was expected as I’ve been filling the rot with dutchmen and epoxy for years. This was a dreaded job but surprised at how easy it came out. The weather was hot these last few weeks; more New Orleans than the Jersey Shore but there was usually a breeze in the shed. 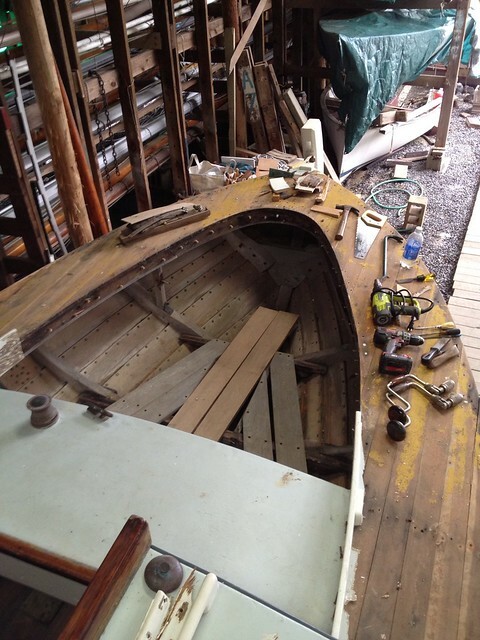 Absent the removal of the jib eye bolts, the deck’s ready for scraping, fairing and sanding. All in preperation for her move back into the wood shop and her new deck covering. 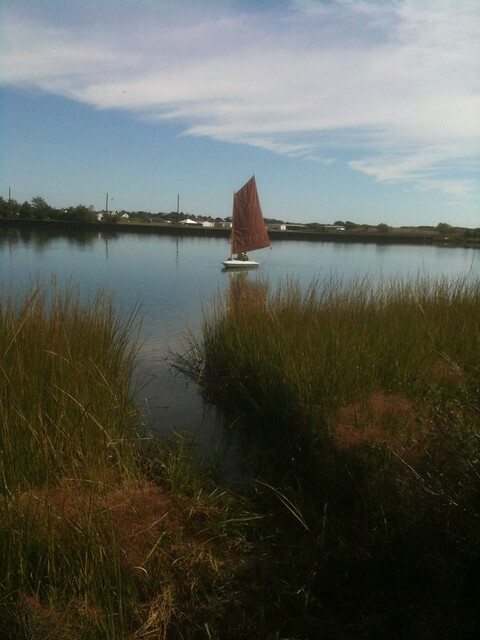 In between Sjogin work, work work and bringing our gardens to a semblance of pre-Sandy bounty, I managed to sneak in a couple of Speedwell sails. Hove to off the marsh across Stockton Lake. The building is the abandoned Little League field house. 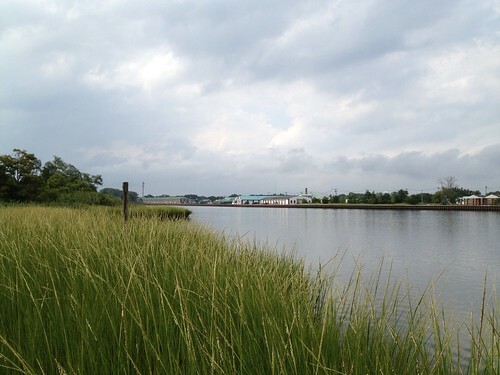 It would make a great spot for a community boating center. Perhaps having lots of oar, paddle and sail boats on the Lake would squeeze out the jet skis. Other news: As some of you know I post on Facebook as well as here. I just created a Facebook page for Sjogin. Here’s the link. I hope to configure this WordPress Blog so the Posts appear on FB as well. And maybe the frequency of my Posts will increase. Here are a few pics from the last few weeks. I’ve also added a section on the right side of the page to show the current Instagram pic posted from my iPhone. Let me know if it works for you. Cruising along the Army Camp bulkhead after finding a bit of salvage. The marsh by the Camp tends to collect treasures like this. And garbage but that’s another story. Old friend. 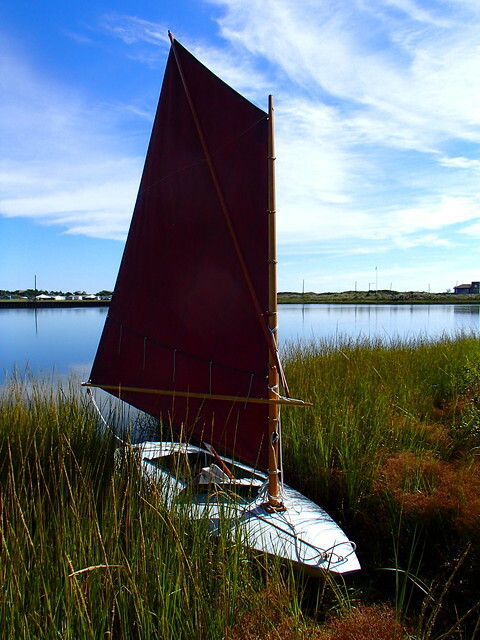 Tom’s Columbia Model dinghy ready for a row. This is an illustration from L. Francis Herreshoff’s The Compleat Cruiser. 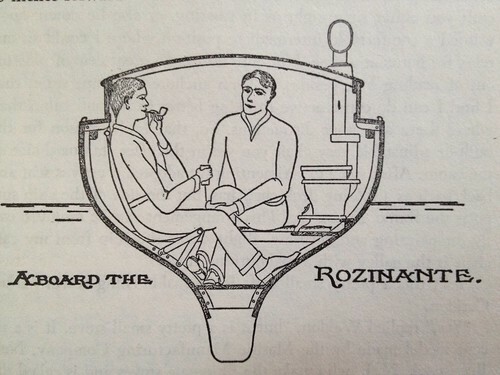 This shows Weldon and Corridon down below on the Rozinante sitting by the stove and chatting about boats. I think this image stoked (pardon the pun) my desire to have a small stove on Sjogin. The drawing was done by Herreshoff. This is Sjogin’s original cotton main. If I have a chance this fall I’ll bend them on for old times sake. Finally a pic from our garden. 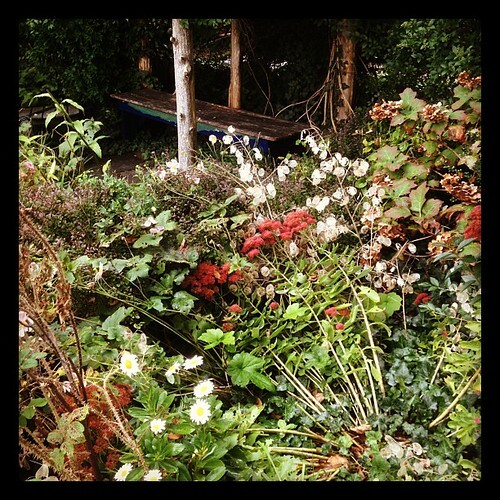 By this time of year the garden has gone wild and has a mind of it’s own. Wait till next year for a little more order. 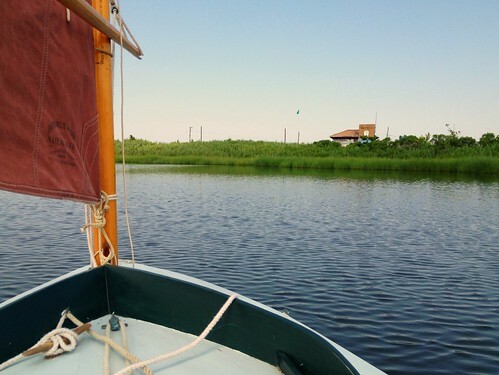 It’s been 35 years, but I finally went sailing on Stockton Lake in Speedwell, our Phil Clarke Duckboat last week. She was bought from Phil in 1977 and kept on Stockton Lake at a friends dock for a while. She’s the last Duckboat Phil built (Number 14) before Pop Beaton took over the plans and molds. I think the first times my sons Jeffrey and David sailed by themselves was on her. She eventually went to Beaton’s for storage and eventual restoration. She’s a bit heavy for her size (keeping her in the water doesn’t help) and it’s a struggle to roll her from our yard down to the water. I think I’ll set up a haul-out to a mooring next year. And also give consideration to having a dock built. A very light day on Stockton Lake. Even at half tide there’s plenty of water. Hope to have a few more sails before she goes back to Beaton’s. Here she is pulled up on our beach. A dock and float would make life a lot easier. 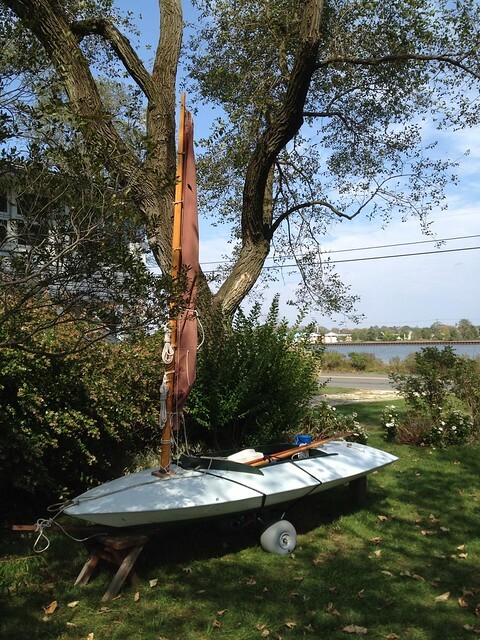 The oar was jury rigged to allow steering without the rudder. With the board almost all the way up she can go to windward (sort of) in less than a foot of water. It’s important as the lake dries out at low water. Eventually an oarlock will be installed for sculling as well as steering.